When the sun rises on a Florida morning after a frontal passage you can see some beautiful images. Such a moment was before my eyes this past week. The various hues of pink in a Florida sky are hard to duplicate with a paintbrush though many an artist has tried. The temperature has dipped down to create frosty mornings and cool nights but nothing compared to the recent ice and snow up the eastern seaboard and mid Atlantic States. Its moments like this I am glad I live in Florida. I take my camera out to practice with the fill flash this week. In the predawn light you can find a variety of songbirds in the trees and near the neighbor’s birdfeeders. I capture some more Robins passing thru, Chipping Sparrows feeding, beautiful House Finches and some Goldfinches in winter colors. I call these little songbirds “Shirley birds” after the Editor. This morning as I scan one of the trees a rather large bird catches my eye. 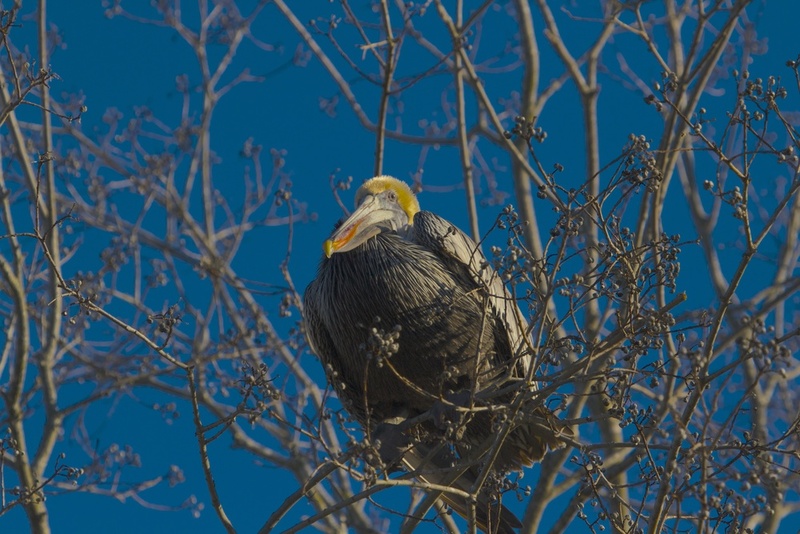 A Brown Pelican is sitting high up in one of the trees by the river. I didn’t even see it the first time I walked by. It rather nonchalantly peers down its long beak, seemingly undisturbed by my presence. I began to ponder how to get a good takeoff shot of those massive wings. Turning on the fill flash so as not to get a shadow under the wings, I wait. After a while the pelican begins to realize that I am not going away and starts to fidget and flap a bit. Finally it raises those massive wings and takes flight. Click goes the doohickey. I thought that would be it, but it glides over to the dock a short distance away and gently lands on the copula railing. I slowly walk up the pier towards the pelican expecting it to fly. Instead, it hops down on the dock in front of me at a safe distance. We both sit down and look at each other. Moving as slowly and gently as a feather floating on the water, I begin to speak to the timid visitor to calm and reassure it that I mean no harm. I beckon the pelican closer and to my surprise it gets up and begins to saunter towards me, perhaps expecting some sort of handout. The doohickey is clicking away. Then I had my other moment. As the bird moves out of the shadows, I realize that the sun is shining bright, way too bright for my exposure settings. I adjust them but not before I also realize I had not turned off the flash.. AHHG! Not a pleasant moment to be sure. Most of the close up photos were overexposed but I got a few keepers to share anyway. Beautiful pink Florida sunrise. What a serene moment. Tricolored Heron reflects in the predawn light. 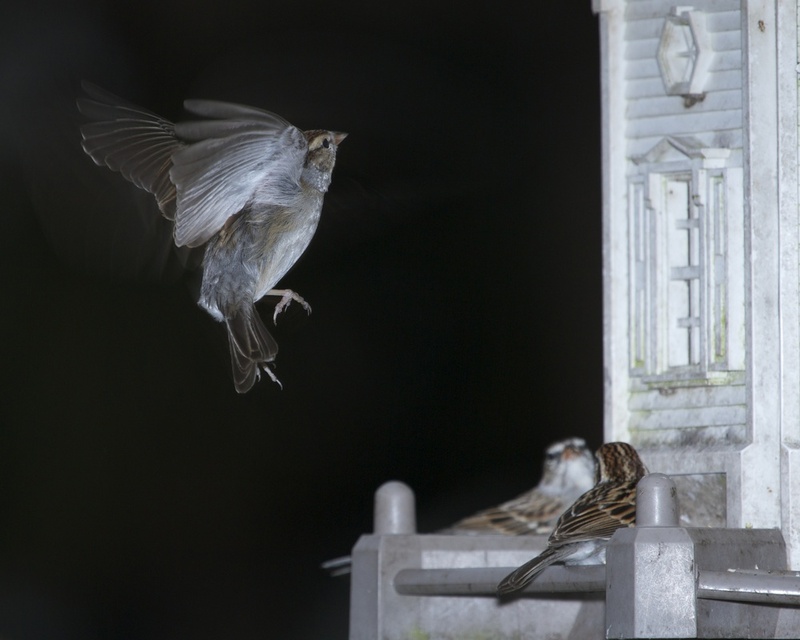 Chipping Sparrow flutters down to feed while friends look up. House Finch catches the morning light. Brown Pelican rests high in a tree near the lagoon. Hey, see that fat pelican up there…bet the branch breaks..! I'll teach you two to call me names…lookout! Need a frame stretcher there fella? The pelican stretches its broad wings and glides to the pier nearby. Cautious eyes glance at me as I approach. I move slowly and gently like a feather floating on a river. Beckoning it closer, to my surprise it gets up and saunters towards me! Close enough for government work? Turn off that darn flash! I can see again! Thanks. Am I cute or what! And then the moment was gone…but what a moment.